'Magic: Puzzle Quest' 1.7.1 Arrives - D3 Go! Hi, everyone and Happy almost-Halloween! 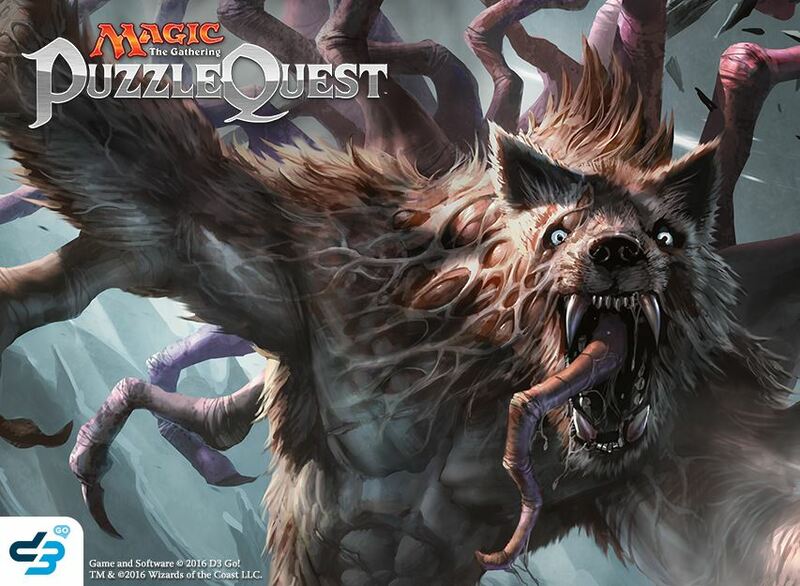 The 1.7.1 update for Magic: The Gathering – Puzzle Quest is now live. Awesome new features include; speedier gameplay, the Emrakul’s Corruption event, and lots of exciting Eldritch Moon cards. Read on for details! We are introducing a new card set to the game: Eldritch Moon! Follow the end of the Shadow over Innistrad story with the reveal of the Eldrazi titan Emrakul! 65 new cards are added to the Shadow over Innistrad boosters. Eldritch Moon is a smaller set, like we’ve previously done with Oath of the Gatewatch. The set does not include Common cards at all – every Eldritch Moon card is Uncommon or better. We’re also introducing 2 new offers: with every Fat Pack, you’ll get an extra guaranteed Eldritch Moon card, and with every Big Box you’ll get an extra booster pack with a guaranteed Rare or better Eldritch Moon card! You can also win Eldritch Moon boosters through various events, which contain a guaranteed Rare or better card. We are also introducing two brand new mechanics to the game, Meld and Emerge. Meld requires two card siblings, which transform into another powerful form once both are on the battlefield. Creatures with Meld play as normal creatures, but transform once you play their sibling card. For example, Graf Rats and Midnight Scavengers, two new cards for Eldritch Moon, Meld together. If Graf Rats is on the battlefield and you play Midnight Scavengers, instead of being played, Graf Rats will transform into Chittering Host. The same happens if Midnight Scavengers is on the battlefield and you play Graf Rats – Midnight Scavengers will transform into Chittering Host. Another advantage of Meld cards is that once the transformed version is on the battlefield, either version of the sibling cards will reinforce the creature, making Meld cards much easier to reinforce. Emerge is a new ability that some cards possess. When a card has the Emerge keyword, it gains mana equal to the listed number next to it every time a creature you control dies. We have updated the Activity Hub to be easier to read and navigate through categories. Events and Special Offers now rotate on their own categories, reducing the amount of clutter the menu would present – you can now also much more quickly go to your Free Boosters and cycle through your events, event rewards with a lot of ease. As some of you have noticed, in the previous update we improved the summoning speed for tokens – they are now greatly faster. We will continue to look for opportunities to see where we can improve the speed of the game to provide a better experience. Emrakul is back with avengeance in Eldritch Moon! Emrakul’s Corruption is the newest event in Magic the Gathering: Puzzle Quest. In this PvP event, you’ll battle decks created by other players, fighting over three nodes – each with special bonus objectives. Blue Node: earn a bonus ribbon by casting 8 or more supports during each fight. Red and Green Node: earn a bonus ribbon by casting 6 or more Werewolves during each fight. White and Black Node: earn a bonus ribbon by casting 8 or more Vampires during each fight. On each node, you can earn an additional ribbon by summoning 8 or more Eldrazi. Bonus objectives can be completed multiple times! Compete in Emrakul’s Corruption, and other weekly events, to win Mana Crystals, Runes and Boosters. In addition, each weekend event will feature an exclusive Rare card. Members of the top ten coalitions in each event will receive a Mythic Card from Eldritch Moon. For full rewards information, click the “Rewards” button in the Event menu. Eldritch Moon will have a brand new selection of special offers – including Planeswalkers, Mythic cards and special bundles. Keep an eye out for the legendary Eldrazi “Emrakul, the Promised End.” This 13/13 titan has flying and trample. In addition, when Emrakul enters the battlefield, each card in your opponent’s hand costs 13 more mana until the beginning of your next turn and each creature your opponent controls is Disabled until the beginning of the next turn. Embrace the power of 13! Check in every week for new limited-time offers! Multiple Bug Fixes: Gameplay, Localization and Cards.